Zaza stylish slim profile leather belt holster case. Customizable for all smart phone devices. Genuine leather slim profile belt clip leather case. 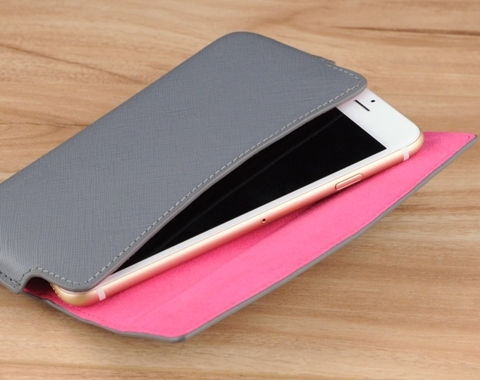 Customizable for any smartphone device with any protective case, or extended battery, installed. Using the finest workmanship, our team of leather artisans beautifully wrap a hard shell with your choice of genuine leather color and texture to give your smartphone the highest quality phone case you can find on the market. The cases are crafted perfectly. High quality. It's worth the wait and price. 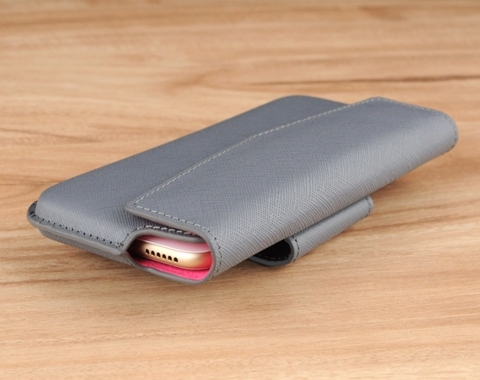 I just purchased the leather holster for my iPhone 6 Plus. I received an extremely high quality, hand-crafted leather product that feels like a luxury item. It fits perfectly and is very elegant. I had previously purchased another model for my iPhone 5 and was so satisfied that did not hesitate to order one for my new phone. A great product that I highly recommend. The materials and workmanship, fit, finish and overall appearance are all "top drawer"
These are excellent custom-fit phone cases.New phones keep getting larger, so I buy one every time I upgrade my phone. I'm very happy with my new saffiano leather holster for my Droid Turbo 2. Best Quality, superb fit, no tugging, binding, fits great. I can see many years of use of this product for myself. I ordered two customized holsters, different colors, for my new iPhone 6. It has been especially difficult to find pre-cut holsters that accommodate a heavy duty phone cover. Zaza was the solution. I sent specific dimensions; the products arrived with 6 weeks and fit PERFECTLY! I couldn't be more pleased. Thank you! From the quality of construction to the quality of the materials, it is a great buy! The pouches dimension match my specifications perfectly. 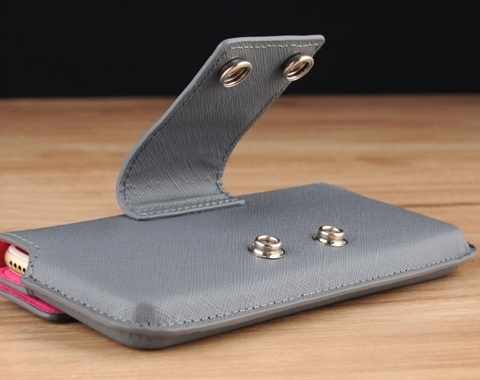 The Zaza design protects my phone from the elements, while allowing for easy access to it at the same time. The horizontal attitude of the case allows for free movement without the need to adjust the case out of the way. I agree with 'kjn' (- posted 12/24/14) about the need for an opening at the bottom to push the phone out of the rigid case. But as stated " CUSTOMER CAN REQUEST FOR BOTTOM OPENING TO ACCOMMODATE THIS REQUEST IN THE SPECIAL REQUEST WHEN ORDERING". I didn't know I'd miss this little detail, and never thought to add it when ordering. My Galaxy Note 4 came with a Flip Cover, and I got a call to verify the dimensions before they started building the case to accommodate this accessory. That is what custom made means to me. This is a large phone and there is no other large 'phablet' holster out there. Story Leather came through on this one. My prior holsters ran from $20-$50 and averaged a year each. I hope this investments in quality leather and workmanship outlasts the device it was bought for. As I get into outdoor weather, I may order another style more suited to my active lifestyle. Very high quality; perfect fit, great quality, good value for price. But ... the issue is sliding the iPhone 6 in and out of the holster. There is no easy way to "pop" the phone up from the bottom so that you can feel confident aboutr lifting it from the holstor. You have to reach from a top corner and grap and lift, and then try to put you whole hand around it. For guys with big fingers, it is a very difficult grab and lift operation; there really should have been narrow opening at bottom of holstor, so you can pop up with pinky while grabbing with hand. Paying nearly 100 dollars, I was kind of disappointed with how careful I have to be with my fat fingers, maybe fine for those with good grips & small fingers. Otherwise, great and beautiful produce, very fashionable. STORYLEATHER RESPONSE - CUSTOMER CAN REQUEST FOR BOTTOM OPENING TO ACCOMMODATE THIS REQUEST IN THE SPECIAL REQUEST WHEN ORDERING. I received my leather belt holster for my iPhone 6 Plus. The phone fits perfectly and the quality of the case is outstanding. It was exactly as promised and well worth the money. Thank you so much for making a great product! phone fit very easy, case nice put together. I was very pleased with the Zaza and even more pleased with the personal service I got from Story Leather regarding size and fit. It is Pricey but I would order again in a heartbeat!! I am very pleased with my new cell phone case...it looks great...it fits great...and it's very well made down to & including the stitching! YES, I'm very happy with this purchase. 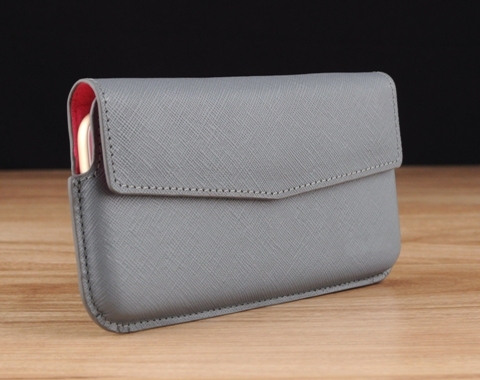 I am very please with the Zaza customized phone leather case . Is an elegant and a unique high quality product. With satisfaction I do recommends this company, and their product. Surprised to receive it as it came with far betond my expectation. Looks perfect, feels perfect and works perfect. Never encountered belt pouch with this much satisfaction ever.. The case is very professionally made. It was made exactly to the dimensions I submitted. It fits the Snow Lizard case I have on my iPhone 5 perfectly. We just received the belt holster case for my husbands phone and it fits beautifully. He is very pleased with the design and I am pleased with how great it looks. We would highly recommend this product!!! My husband joined the smart phone generation a couple of years ago but has never found a case that works well for him. He found your site on the internet and showed me what he thought would be the ideal case for him. He got his case as a Christmas present and has been so pleased with it he is thinking about ordered a second case! We were both very pleased with the workmanship and the ability to tailor the product to meet our needs. WoW,I HIT GOLD Review by john o. Very pleased. Super high quality product! I would like to thank you for the great cell phone case. If I had one thing to add it would be, I wish it had a slot on the bottom so you could push the phone out of the case instead of having to go into the case to pull it out. Love the color and the quality of the product. Thank you very much. Can I make this case to hold a pair of glasses? We can make this case to fit any device as long as we have the proper dimensions. However, for glasses, it will not have the mount on the interior for the nose pieces on the glasses to sit. Please do note that we do charge an oversize fee when cases have dimensions greater than or equal to 6.69 in. / 17 cm. This fee will vary depending on the dimensions provided. You will be informed of the fee after your order is reviewed by our production team.